Ants are social insects that belong to the same order as the wasps and bees. They are of particular interest because of their highly organized colonies or nests which sometimes consist of millions of individuals. Ant societies have division of labor. Individuals are divided into workers, soldiers, drones and queens and colonies can occupy and use a wide area of land to support them. Ant colonies are sometimes described as super organisms because the colony appears to operate as a single entity. Ants have colonized almost every landmass on Earth. Some of these amazing insects are hunters. Some are harvesters. Some farm fungi. Some keep slaves. Others keep caterpillars or aphids. Scientists have identified more than 11,000 species of ants worldwide. 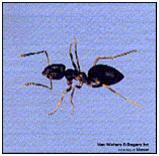 Minnesota alone has more than 100 ant species. Most kinds of ants make their homes in tunnels in the soil or in wood. They live and work together in communities made up of hundreds or thousands of individuals, almost all of them sisters. Scientists think the world has about 10 quadrillion ants. Lets face it, that is a whole lot of ants! All ants share one primary task, to protect and care for the colony. In order to accomplish this, ants require food, moisture and shelter. A colony of ants may range from a few dozen to tens of thousands. Ant nests are commonly found outside under wood piles, flagstone or brick patios, and under rocks and garden stones. Ants in the house may nests in wall voids, behind insulation, or in or around wood previously damaged by moisture. You are most likely to find ants in the kitchen or invading your property elsewhere when they are foraging for food. Foraging ants account for only a small percentage (typically 10% or less) of the colony’s size and it is important to understand that ants will travel extremely long distances in search of food or harborage. Once these foragers locate and establish a source of food, ants will produce a scent trail (by way of pheromones) leading to and from the nest. This pheromone trail provides direction for the ants to follow between the nest and food source. This is why you will often see ants, like the Odorous House Ant, marching back and forth along one line with little or no deviation. 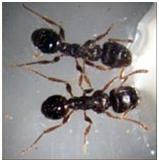 Carpenter ants are one of the most common ants found in Minnesota. They are also one of the most difficult to control. The first indication that you may have a carpenter ant problem is by spotting large, black ants in or around your home. In many cases, you may only see a handful of ants over several days. Another sign of carpenter ant activity is the small piles of sawdust they leave behind as they tunnel their way through wood. This debris, known as “frass”, will collect beneath the site of the nest and oftentimes will include bits of dead insects. Carpenter ants are generally black, red or brown or a combination of red and black. The workers in a colony can range from 1/8th of an inch to 1/2 of an inch in length with the queen reaching nearly 1 inch in length. Carpenter ants are not typically thought of as dangerous and generally do not bite; the real concern with an infestation of carpenter ants is with their ability to damage and weaken the structural integrity of your home. The best way to control carpenter ants is to find and destroy the nests. This is often easier said than done. What you need is a Minnesota Pest Control Expert who will locate the nest location(s) and eliminate all the ants. Identification of the particular species of ant is vital to implementing a control program. At Eco Tech we have been dealing with these annoying pests for 15 years. We are able to tell the difference in ant species. Also, we are well trained in locating their nesting location and terminating the colony in a timely manner.